Drawing 108 is for an unidentified chimney-piece. The drawing is labelled as for the Marquess of Abercorn, thus dating it to after October 1790 (when Lord Abercorn inherited his title). 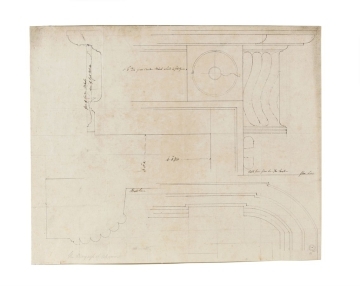 The Marquess's title attributes the drawing to Soane's second phase of building works at Bentley Priory. The chimney-piece appears to follow a similar design as that drawn for the music room in Earsham, Norfolk (q.v.) in 1784 (see SM 81/1/70), and that at John Patteson's house in Surrey Street, Norwich (q.v. ), c.1790 . The chimney-piece at Earsham has a quarter-pilaster motif of reeds bound with bowed ribbons. As in drawing 108, strigilated flutes beside sunk circular bosses are above the reeded jambs, and a larger boss is centred on the frieze.